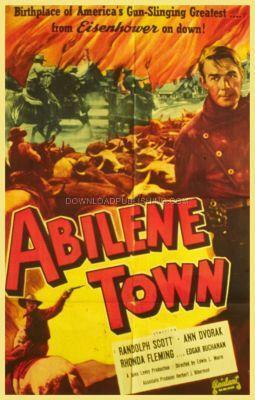 Five years after the Civil War, Dan Mitchell (Randolf Scott), the Marshall in Abilene, Kansas tries to keep a steady balance between the Homesteaders and the Cattlemen, even dividing Main street with the Cattleman's Saloons on one side and the regular town folk on the other. The Town Sheriff is not much help as he prefers to gamble than do his job. The peace is threatened when new Homesteaders arrive in town and try to claim land on the side of town that the cattlemen have claimed for their cattle. Production Company: Guild Productions Inc.